Three members of the group were convicted of supporting a terrorist organisation, al-Tawhid - which is said to have links to al-Qaeda. Al-Tawhid is led by Jordanian Abu Musab al-Zarqawi, who is wanted for leading insurgent attacks in Iraq. The three Jordanians and an Algerian denied the charges against them. The Jordanians - Mohammed Abu Dhees, Ismail Shalabi, and Ashraf al-Dagma - were convicted of plotting attacks and belonging to a terrorist organisation. The Algerian, Djamel Moustfa, was found guilty of plotting attacks and supporting a terrorist group. Much of the case against the four was based on evidence from Shadi Abdellah, who was arrested at the same time, in 2002, and confessed to plotting to attack Jewish targets. 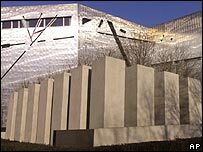 Abdellah, who was jailed for four years on similar charges in 2003, said the group discussed targeting Berlin's Jewish Museum and a Jewish-owned discotheque or bar in Dusseldorf. The prosecution described the defendants as the "most important members" of the German cell of the Islamic group al-Tawhid. Judge Ottmar Breidling, giving the verdict said: "In this case, Abu Musab al-Zarqawi should also be sitting on the defendants' bench."